Connecticut River Artisans is happy to begin our 2019 “Artist of the Month” series with Sally Rothenhaus, a photographer and maker whose specialty is “Art for Outdoor Living”. A long-time professional photographer, Sally now uses heat and pressure to transfer images onto metal. 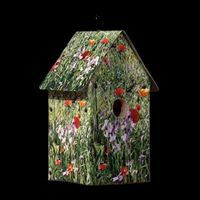 This is then used to cover her beautiful and very durable birdhouses. She recently brought the outdoors in, using similar materials to make unique clocks with the feel of a kaleidoscope. Like all of Sally’s work, they are whimsical and beautiful! Sally’s work was showcased on WFSB’s “Better Connecticut”. However, there is no need to wait for reruns to meet Sally and see her amazing work. Sally’s reception will take place on May 5th from 1:00 to 4:00. Join us for fun and refreshments. There will be a 20% discount on her work that day.